This is both richer and more complex than the standard twelve year old Knappogue Castle. Named 'Twin Wood' because both Bourbon and Sherry cask types have been used for the maturation. It seems that the sherry casks have added to the body and depth and also brought some spice and dried fruit flavours. 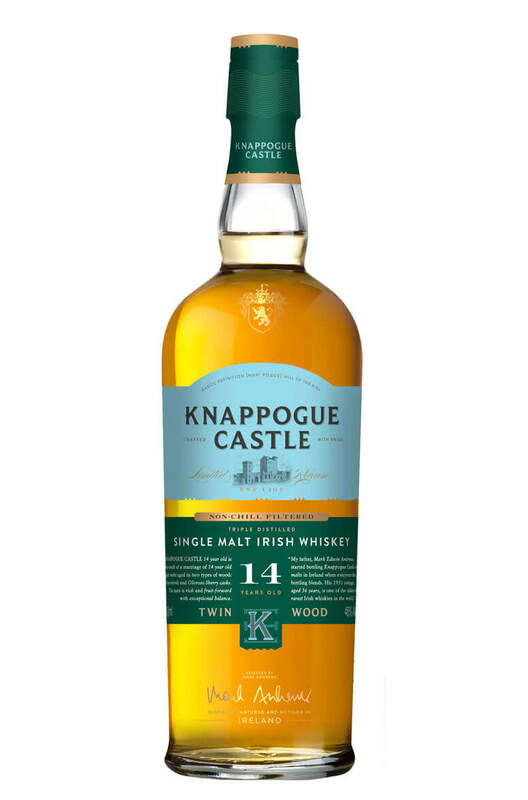 Like most of the current Knappogue Castle whiskeys this was made using unpeated, triple distilled single malt whiskey from a Northern Irish distillery. Limited numbers were made of this whiskey and it is bottled un-chilfiltered and at 46%. Nose The typical orchard fruits/apple pie character of the malt is given depth with the use of Oloroso Sherry casks, in the form of fleshy fruit – plums and apricots. The bourbon cask influence appears as a sweet vanilla note which is in harmony with the biscuit-like aroma of the barley. Palate The nose sets up the expectation of a real mouthful of flavour, and it follows through. The body is rich and fruity; with hints of green apple with the zest of grapefruit. The malt helps to bring out the quality of the wood: sweet vanilla with light tannins from the charred oak.Finish is medium in length, going from full fruity notes to dry yet pleasant barley conclusion. This is the second such bottling in the single cask series from Knappogue Castle. It was produced in..